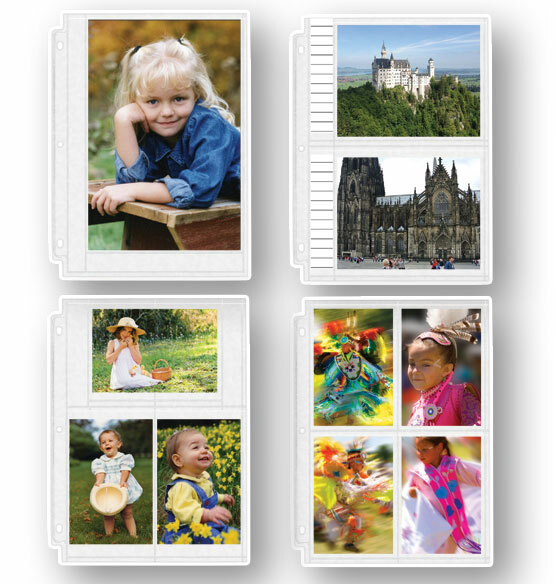 All Exposures archival double weight assorted photo pocket pages are made of photo safe materials which in turn make them the safest photo album refill pocket pages available to protect your most precious photos. In fact, all these archival refill pages pass the same safety test approved and utilized by the Library of Congress and National Archives. There's no more strict test and no safer pages. 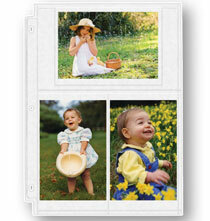 Our photo album refill pocket pages are polypropylene. They don't contain any of the chemicals found in lower-quality refill pages that bleach precious pictures. 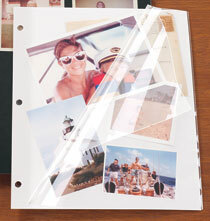 Three ring refill pages fit any standard binder. 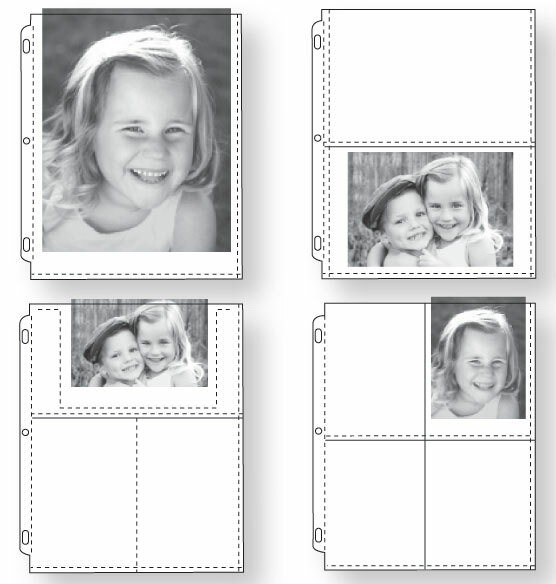 Includes 1 - 8" x 10" photo page; 2 - 5" x 7" photo pages; 3 - 3 1/2" x 5" photo pages; and 4 - 4" x 6" photo pages. Double Weight- High durability and protection suited for heavy use. I have been using Felicity albums for years. While I generally use the same type of page, there are occasionally times when I want to insert a picture of a different size. The pack of assorted sizes gives me other options without forcing me to commit to purchasing many more than I need. Really unfortunate that the various pages are not uniform sizes. so be aware and check the "specifications" they differ significantly!! I am really disappointed. I like the multi pack because photos are various sizes & shapes. Wonderful books - I have been ordering them for years. Great assortment love having the 8 by 10's not a size I usually need. 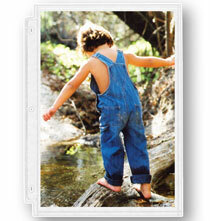 Good choice for first time photo album makers. Love that I can put different sizes on the same album page. To me, offering pages for a variety of photo sizes makes sense, especially for a collection of photos saved over a lifetime and in several different formats. I have many different sized photos especially historical ones. I am making an album for my adult son with all his childhood pictures. Just starting out with this product and need to see the pages. I only take 4x6" photos and this layout gives me the most for the least space. what is the overall size of these pages, which albums do they fit into? BEST ANSWER: Thank you for your question. We have included below the measurements of the photo pages below. These pages will fir into any of the regular three ring albums. We hope this information will be of help to you. 4" x 6" pages - 9 1/4" x 11 1/4"
3 1/2" x 5 “ pages - 9 5/8" x 11 3/8"
5" x 7" pages - 8 3/8" x 11 1/4"
8" x 10" page - 9 1/8" x 10 3/8"
what are the dimensions of the spine? I am trying to duplicate ones that have a spine of of approximately 3"
BEST ANSWER: Thank you for your question. The pages are 9 1/4" x 11 1/4". We hope this information will be of help to you. You didn't answer my question. I had to call customer service to get an answer. 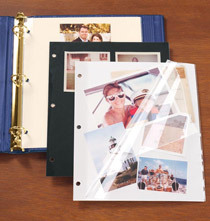 Do you sell a 3 ring binder photo album that is big enough for 13" x 13" photo album pages? If so what is that item number or name? BEST ANSWER: Thank you for your question. The link below shows the only pages that holds a 5x7 we have.We hope this information will be of help to you.